Wow! We have already surpassed 100 referrals this year! We are grateful to our clients, CPA’s, and fellow attorneys who refer their clients, friends, and family to us. We truly enjoy helping people fix their tax problems, and we appreciate the privilege to help every person you send our way. The “End” Does Not Always Justify the “Means” – Even with Taxes! When it comes to tax collections state policymakers are constantly faced with hard choices about what’s fair and effective for collecting taxes from fellow citizens. These tough decisions become complicated when you’re talking about collecting overdue tax bills. One “interesting” measure our legislature has deemed appropriate for getting the attention of Louisiana taxpayers who owe back taxes is the suspension of driver’s licenses. You’re recently divorced and finally getting your life back together — ready to move out of the apartment you’ve been living in with your kids into a home with a yard. After touring dozens of homes with your Realtor, you finally find the perfect home. The Realtor perfects the purchase agreement and the loan application is submitted to the mortgage company. But, then the “elephant” emerges. When the mortgage company pulls your credit report, you discover for the first time that the IRS filed a notice of federal tax lien three years ago in your ex-husband’s name. If you owe the IRS more than $50,000, there's a chance your passport could be suspended. Find out more about this new law here. Do you have Louisiana State tax issues? You'll want the inside scoop on the Tax Amnesty the state is offering for ONE MONTH only! IRS Penalties: How Can I Seek Relief from Penalties Assessed Against Me? You're finally ready to face your tax problems head on--but the amount you owe has INCREASED due to penalties and interest. What now? Dont worry....You DO have options. Here in Louisiana, we pride ouselves on our local businesses. But how does someone start a small business? Where do you even begin? David Bordelon gives us a few great tips for those who want to start their own small business. 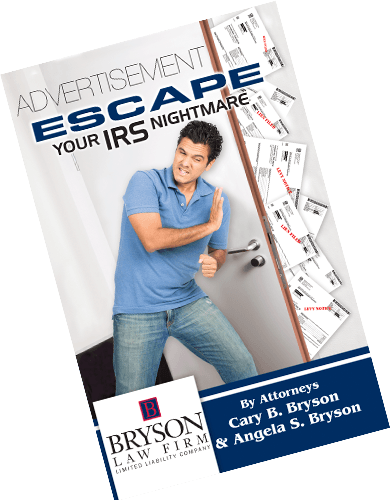 Here at Bryson Law Firm, LLC, we frequently receive calls from individuals who are trying to purchase a home or sell their current home, but are prevented from being able to due to an IRS tax lien filed in the public records and/or with the credit bureaus. I wanted to take this opportunity to explain to anyone in this situation some of the options available to you. President Obama has ordered the Department of Labor to issue new rules increasing the number of employees currently eligible to receive overtime pay. So the question stands: what now? While the May 2015 IRS hack may be old news, taxpayers are now being informed that their information has been accessed. Find out more about the investigation of the hack and how tax payers are being affected.